Adding 5G NR operating bands to an already overcrowded and congested spectrum increases the risk for interference with other wireless communications. Your 5G devices will need to operate in adjacent cellular and sometimes within the same spectrum as other wireless communications systems. 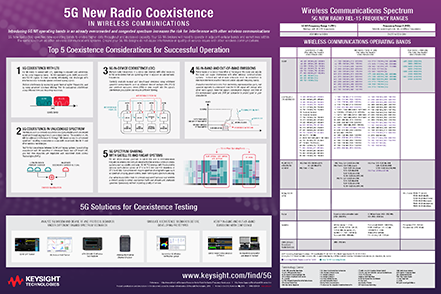 Get the information you need to ensure your 5G NR devices don't cause interference or quality-of-service issues with other wireless communications. You can order a copy of this 24 x 36 inch poster and pin it up for quick reference. You can also download a digital version today to use until your printed poster arrives.